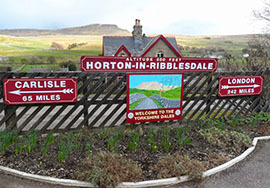 There are 11 stops along the route of the Settle-Carlisle Railway. The stations on the line are a vital link for the people living in the surrounding rural areas. In the past, local produce could be transported with ease to many cities and towns around the country. The numerous goods sheds (and cattle docks) on the line were once busy centres, despatching and receiving a wide variety of produce and animals. These too were all built to a single standard design, varying only in length and building materials. The line and its stations have been designated a conservation area ensuring its continued use and work continues to regenerate the line and preserve its future. The stations at Appleby and Settle are manned and the staff are available to answer queries, sell tickets and provide assistance to passengers. 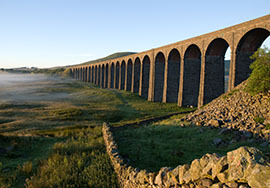 As well as selling tickets to travel on the Settle-Carlisle line, you can buy tickets for travel elsewhere in the country. Unfortunately, left luggage facilities are not available at these stations. 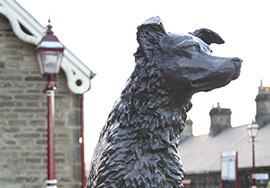 Car parking charges apply at Appleby and Settle Stations; tickets for the car park are available from the Pay & Display machines. Parking charges are £2.00 for one day (24 hours) with a five-day ticket available for £8.00. If you are boarding the trains at the unmanned stations along the line, you will be able to buy your ticket for travel on the train from the conductor. The current train operating company, Northern, have plans to introduce ticket vending machines at most of the stations. 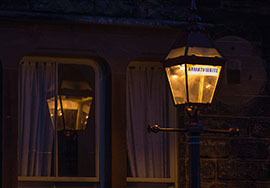 Settle is known as the gateway to the Three Peaks, Pen-y-Ghent, Whernside and Ingleborough, and is situated at the foothills of the Pennines, amongst some of the most picturesque scenery in North Yorkshire. 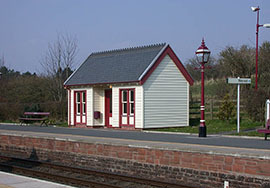 Horton station is built on the ‘small station’ design. A trip up the line not only gives fantastic long scenic views across hill and dale but also the well kept stations and gardens are a delight to behold. Ribblehead station and the Viaduct that spans Batty Moss just to the north of the station, probably represent the very heart of the Settle-Carlisle railway line. 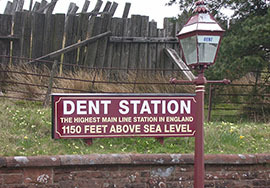 Dent station is England’s highest mainline station, standing as it does at 1,150 feet above sea level and providing spectacular views of Dentdale. Garsdale station was previously known as Hawes Junction and redundant tracks still show the branch line to Hawes, the Wenselydale line. Kirkby Stephen is a small town in the Upper Eden Valley. The station building is a wonderful example of Midland Railway architecture at its best. Appleby is an attractive market town with a great deal of charm. A beautiful picturesque place to visit. 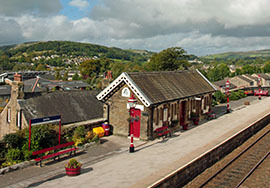 The station is set fairly high above the town, with a well marked walk down to the town centre. 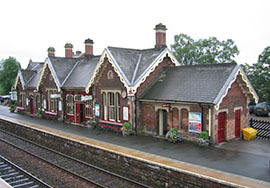 Langwathby is an unmanned station having a waiting room on each platform. 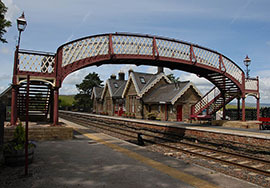 The station at Lazonby serves the two villages of Lazonby and Kirkoswald, which are approximately two miles apart. Armathwaite lies on the River Eden and forms part of Eden district. 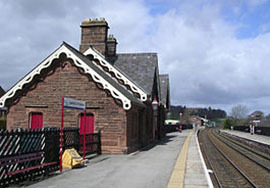 The original Armathwaite station building, now a private house, is a medium sized style station built from local red sandstone. 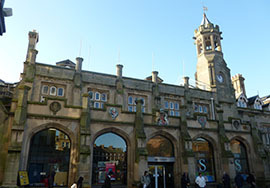 Carlisle is a mainline station serving a number of rail companies. Carlisle is a 2000-year-old border city between England and Scotland.